Two books from February 19, 2014. Plus your Nerd Confessions (about the most impactful retcons in comics) and Aaron's Inner Child. On The Couch: legendary artist Klaus Janson. 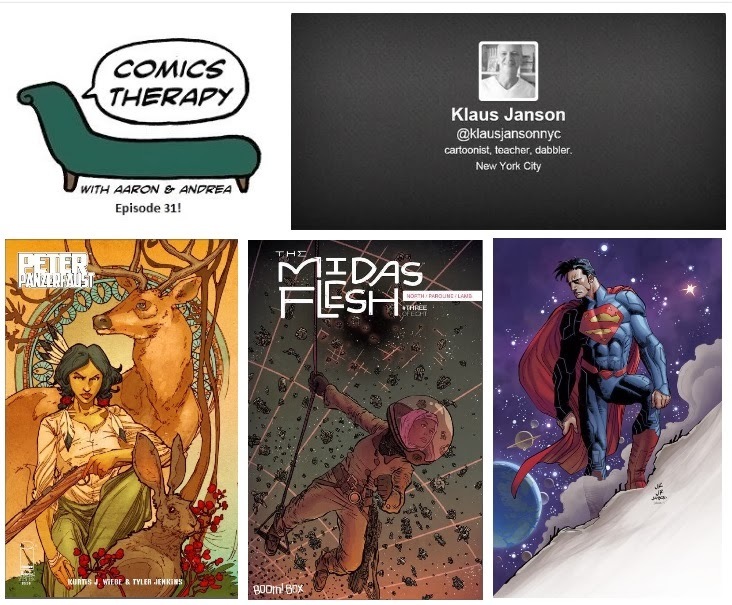 This week’s theme is retcons, Comics Therapy-style. We’re looking at two books that take characters from mythology and literature that we all know and drop them down in an unexpected place or time. Reinterpretations are nothing new in comics, or storytelling in general. Sometimes transporting a premise or a character from his or her origins breathes new insight into a stagnant tale you hadn’t thought about in years. The Greek Myth of King Midas, set in the future, in space, by way of Kurt Vonnegut's Cat's Cradle. That last part is totally Andrea's opinion, by the way. J.M. Barrie's Peter & Wendy, set in World War II, in France, by way of the French Resistance. Mr. Janson has been a prominent penciller and inker for both Marvel and DC Comics for over 40 years. He worked with Frank Miller on Daredevil in the 1970s and collaborated with Miller again on The Dark Knight Returns a decade later. Mr. Janson has taught at the School of Visual Arts in New York City since the 1990s. Recently, DC announced that he would join John Romita Jr. on the upcoming Geoff Johns Superman run.